Creating beauty that functions is my mission. Thank you for finding my website. I’ve been a Landscape Designer for over 25 years working for reputable, successful companies. In 2012, Bedard Landscape Design was born. My specialty is designing for residential properties of any scale and small to medium sized commercial projects. My goal is to delight my clients with a design that inspires them and enables them to move forward with the installation. My motto is to try to get the design correct the first time and surpass the client’s expectations. Over the years my design work has won a number or awards, for the companies I worked for, so I’m confident in my ability to develop the right design for your needs. To achieve these goals we make the first meeting as valuable as possible. My skill is to listen to your hopes and concerns, present fresh ideas you may not have considered and take all this information into account while drafting your design. There is no design challenge too great. In my career I’ve designed custom walls to reduce decibel sound emitting from a neighbor’s heater unit, designed two tiered hot tubs with a slide between the two levels and a grotto roof line cover, designed a large custom roof line to satisfy the clients desire to spend quality time outdoors in a Tudor, English pub style setting. It is true that you are only limited by your imagination. I’ve had the pleasure of designing large scale water features that either look naturalized, formal, contemporary or intricate of detail. Waterless water features with the pond submerged below grade is a client favorite at this point. Faux rock is appropriate for commercial interiors where weight per square foot is critical. 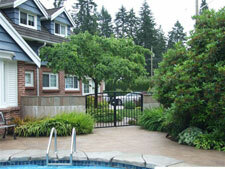 I am very pleased with your design for the landscaping of our home in West Vancouver. I appreciate the time you took to explain to us the different options we can have for our design. I also appreciate the pointers you have given us regarding placing some planters for our existing patio. I would not hesitate to recommend you to anyone who may have similar projects like ours. All rights reserved. Design by Ancell Marketing.